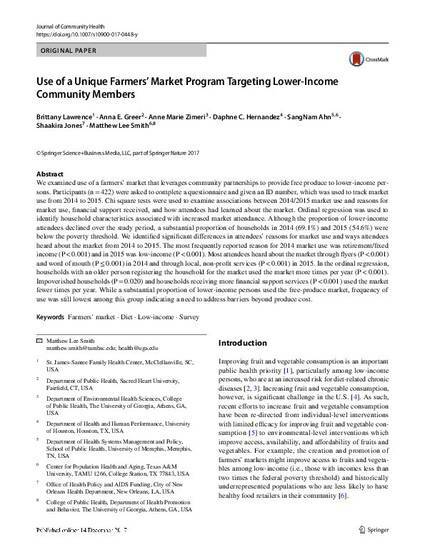 We examined use of a farmers’ market that leverages community partnerships to provide free produce to lower-income persons. Participants (n = 422) were asked to complete a questionnaire and given an ID number, which was used to track market use from 2014 to 2015. Chi square tests were used to examine associations between 2014/2015 market use and reasons for market use, financial support received, and how attendees had learned about the market. Ordinal regression was used to identify household characteristics associated with increased market attendance. Although the proportion of lower-income attendees declined over the study period, a substantial proportion of households in 2014 (69.1%) and 2015 (54.6%) were below the poverty threshold. We identified significant differences in attendees’ reasons for market use and ways attendees heard about the market from 2014 to 2015. The most frequently reported reason for 2014 market use was retirement/fixed income (P < 0.001) and in 2015 was low-income (P < 0.001). Most attendees heard about the market through flyers (P < 0.001) and word of mouth (P ≤ 0.001) in 2014 and through local, non-profit services (P < 0.001) in 2015. In the ordinal regression, households with an older person registering the household for the market used the market more times per year (P < 0.001). Impoverished households (P = 0.020) and households receiving more financial support services (P < 0.001) used the market fewer times per year. While a substantial proportion of lower-income persons used the free-produce market, frequency of use was still lowest among this group indicating a need to address barriers beyond produce cost. Published online first 14 December 2017.